At the beginning of the twentieth century, maternal mortality and infantile mortality rates are catastrophic in tropical countries. Cultural reasons don't incite people to ask for treatment in this domain at a time when, moreover, Health Service physicians consider as a priority the duty of fighting the spread of endemic diseases. After the 1914-1918 war, the service for the protection of mothers and children (PMI) is set up. It depends on the training and the participation of native female collaborators, first of all midwives but also visiting nurses who, going out to meet pregnant women in their dwellings, maintain a link with the health services. Besides, especially in rural areas, the traditional midwives or matrons receive, as often as possible, some training and are subjected to controls. A service for the protection of indigenous mothers and children comes into being. After 1950, the PMI is modernised. Centres are established in towns, qualified personnel are appointed there. Maternal protection and infantile protection make considerable progress. The extended programme of vaccination initiated by the WHO strengthens these results. When Independence is granted, well-adapted plans of action are already in place. In the absence of global statistics, the results of many fragmentary investigations are concordant : maternal mortality is very high (Lefrou* for the period 1921-1930 at Saint Louis in Senegal, Heckenroth* in 1929 in Dakar and, for the whole of the French colonies, Thiroux in 1931, Sorel*, Martial and Beaudiment* in 1939). At the beginning of the 20th century, it is impossible to determine statistics because most of the childbirths take place outside the control of the state authorities. At the end of the century, the mortality rate is estimated as thirty times higher than that observed in Europe. The principal causes of death are the very young age of the mothers, who are often anaemic and suffering from food deficiencies, as well as labour complications, especially over-infection and haemorrhages due to insufficient supervision. In West Africa, even in 1960, prenatal statistics confirm the fact that 80 to 85 babies are born alive in 100 pregnancies. The knowledge of child mortality (the proportion of deaths of children during their first year for every 1 000 babies born alive) is relatively recent because the reliability of these figures depends on the establishment of a dependable census, which is not the case until the teams fighting the great endemics establish it themselves, that is from 1925 in French Equatorial Africa (AEF) and 1939 in French West Africa (AOF). When in 1938, M.E. Farinaud* begins the first anti-malarial campaign on the mountainous plateaux of central Indochina, he devotes the first year to taking a census of the population for the study of mortality rates, which enables him to determine that infant mortality is 310 in 1 000. Twenty years later, in a region of Upper Volta which is just as much ravaged with Malaria, Raba* notes the figure of 130 in 1 000. In France, at the same time, the infant mortality rate is 27 in 1 000. This infant mortality rate doesn't mean much in tropical countries. The major illnesses that a child suffers occur in the second year also, when the immunities transmitted by the mother have disappeared. The mortality rate then is just as high as during the first year. Malaria is the worst affliction and Farinaud* attributes 80 % of the deaths to that disease in a zone where many endemics are rife. In 1957, in Upper Volta, at the end of an inquiry into 4 528 births in Lobi country, Mazer* shows the ill-effects of precocious weaning. When a mother who is still breast-feeding gets pregnant again and stops giving mother's milk to her baby, letting him consume family food instead, it is a way of sentencing him to death. In 15 % of births, the child would have been weaned before the age of ten months, which has had the effect of tripling his chances of dying before the age of two, in comparison with children who have been breast-fed for more than 18 months. Is there a better way of showing the necessity of increasing the intervals between births ? Convincing couples of this reality will be one of the objects of those concerned with infantile protection. Pregnancy and the coming into the world of a child are at the heart of every culture. Every society has its rites and superstitions, its rules and interdictions concerning the pregnant woman, the care given to the baby, the destination of the placenta and the diet of the mother and the child. In 1939, Giordani* writes: "Pregnancy being considered a normal state, the natives in our colonies don't understand why a woman's activity must be diminished during this period, no more than they can understand why the help of a physician is necessary at the time of delivery". 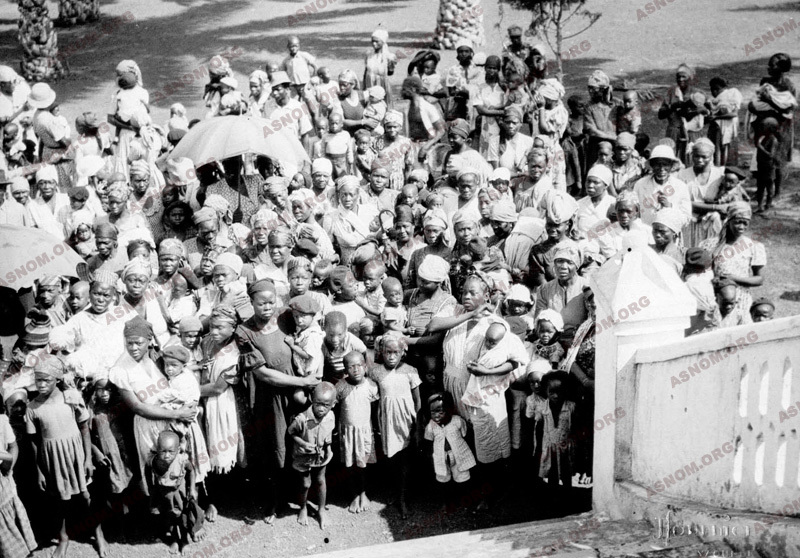 In the French colonies, the recourse to maternity hospitals and pre and post-natal consultations, in the 1930s, varies from one country to another and even from one ethnic group to another. In Niger, the Muslim population refuses to allow a European physician to examine pregnant women and to deliver babies. In the French coast of the Somalis, Islam "forbids women to show themselves to foreigners" during pregnancy and the forty days after childbirth because evil spirits are at work. Neither the woman nor the child should leave the house during this interval... In Pondichery, for Muslims as well as for Brahmans, a man is dishonoured when his wife gives birth in a maternity hospital. At the same time, in the maternity hospitals of Laos, for every 1 000 childbirths, Laotian women are "an infinitesimal number", nine out of ten of those giving birth in hospitals being Annamese. In 1933, the "Most Beautiful Baby Contest", organised by the Red Cross in Dakar, attracts the Animists but not the Muslims who are convinced that "winning the contest would bring bad luck to the baby". - All the urban centres, capitals of federations or colonies which have a hospital are provided with a well-equipped maternity ward with their three basic activities : pre and post-natal consultations, deliveries with the possibility of surgical intervention and care for the infants. - In other conglomerations such as principal towns where a doctor and a midwife are present, a "maternity dispensary" is foreseen. In addition to deliveries, pre and post-natal consultations are organized for mothers and children. A visiting nurse will be available. - In rural areas, where there is a medical centre managed by a nurse, the doctor or the midwife from the principal town makes regular visits. They get to know the rural matrons in order to train and supervise them. - Medical inspections in schools complete the programme, making it possible to detect transmissible children's diseases or great endemics prevailing in the region. Students of the Medical schools participate in this activity. - Mention is always made in official reports of "private organizations" which are an invaluable complement to administrative action. Some are secular like the Red Cross and its branches which are here called "Goutte de lait" (Drop of milk) and "Berceau africain" (African cradle), mostly concerned with infant care (weighing babies, distributing milk, soap, clothes...) and confining their action to townships. Others are Christian organizations, present even in "the most distant villages". These private bodies are often subsidized by the government and, in Indochina, supported by municipal and provincial contributions. Finally, in many capitals, there is an orphanage called "Foyer des métis" (Home for half-breed children) with many abandoned children in them. As can be seen, very high achievements are aimed at, for the territories are extensive, the populations widely spread and sometimes reserved. Giordani* writes in 1939 : "We control only 30 or 40 % of the births declared in most of our colonies". Let us remember that, at this time in France, the majority of pregnant women and almost all of those living in the countryside give birth at home with the assistance of a midwife. In the colonial empire, European midwives, when they are not public employees, work as "colonial midwives", recruited by the Colonial Ministry. They are few, engaged to work with the European population. They work only in the hospitals, for, in the beginning, European women are rare and reside only in important colonial centres. 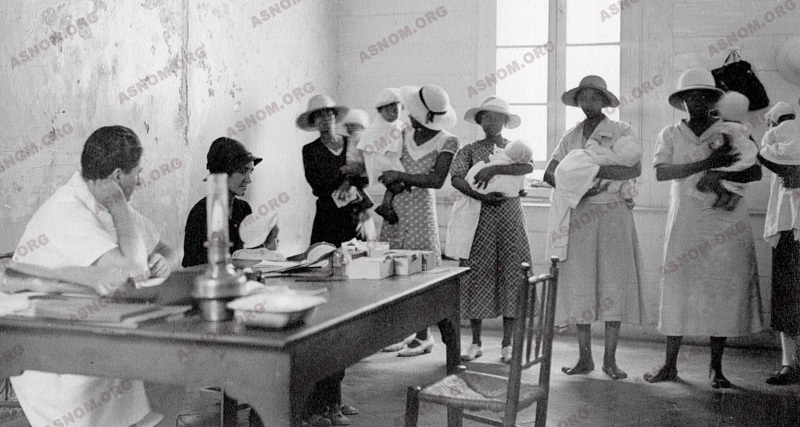 In 1939, for the whole of French West Africa (AOF) with 10 or 12 million inhabitants, there are only ten midwives of whom 4 are in Senegal and 3 in the Ivory Coast. There is not a single one of them in many of the colonies of the federation. There are also two in Indochina and one in Madagascar. The advent of native midwives is a turning point. 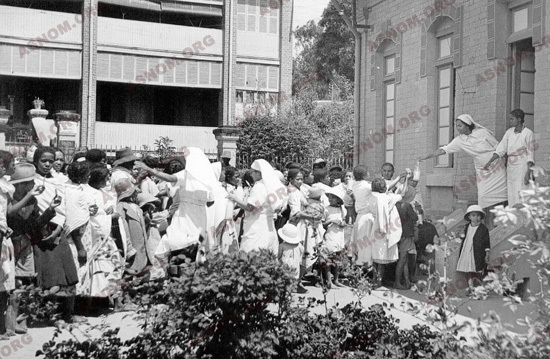 For example, the school for midwives in Dakar opens in 1920 and the first midwives arrive in the Ivory Coast in 1923. Five years later, in 1928, they are sixteen, and three-quarters of the territories are provided with midwives. In the course of 32 training courses, 447 midwives qualify from the Dakar school. Bouffard* is full of praise : "These young women or girls are perfectly capable of performing the task that is set them". The aim is to appoint one midwife to every principal town of a territory where there is a maternity hospital. This new category of nursing staff has only been used in French West Africa and in Madagascar, from 1930 onwards. They are at an intermediary level between the native nurses and midwives and they are trained at the Midwives' Schools of Dakar and Antananarivo. This new branch of the nursing staff is used for about fifteen years. Concentrating on paediatric nursing and prevention rather than on the care and treatment of patients, they form a connecting link between the maternity hospital and the population. They have nothing to do either in the delivery rooms or the wards of the hospital. Their role is to be in contact with the families, have interviews with expectant mothers, control the number and quality of the deliveries performed by the matrons, direct sick infants towards dispensaries, give diet instructions to young mothers... They are the forerunners of "Health Instructors" (éducateurs sanitaires). Through this nursing staff, one observes the qualities of mobility and closeness to the people which characterizes the action of the Colonial Health Service when assisting the population. To help them to get about more easily, especially in Senegal, these agents are provided with bicycles. In spite of their success, visiting nurses have not been used consistently in other French territories. In French West Africa, for example, perhaps because women have become less reluctant to consult physicians, the recruitment of visiting nurses ends in the 1940s. 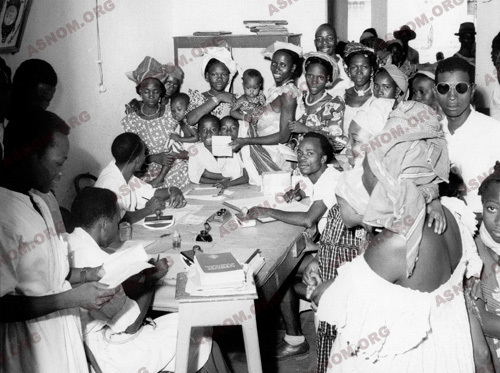 In 1953, a government circular creates in French West Africa (AOF) a body of social workers and helpers for the medico-social service of the PMI. The following tasks are confided to them: "Visiting dwellings, following the progress of patients, discovering new patients and directing them to centres of consultation or vaccination". But their principal activity remains the education of mothers, especially in the matter of food for children. They take over from the "visiting nurses". The Colonial Health Service is the inventor of "social paediatrics", which goes beyond the treatment of individuals and pays attention to problems of the community, where preventive measures are more important than curing illnesses. From time immemorial, everywhere in the world, matrons have practised there profession in the sight and knowledge of the whole community from whom they receive gratitude and consideration. Sometimes this profession is hereditary. The French coloniser, after having tested their aptitudes, decides to include matrons in the official health plans, without, however, making them salaried employees. 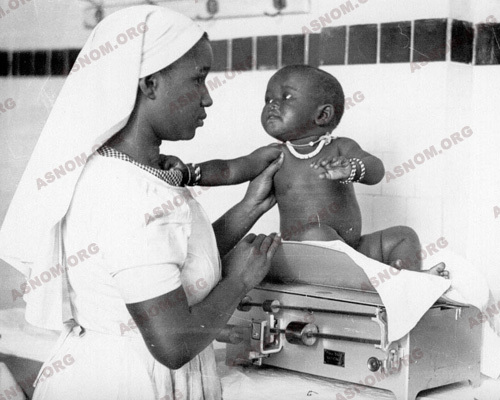 In the 1930s, in Africa, the training of matrons becomes one of the priorities of obstetrics in rural zones. These women follow, at the nearest maternity hospital, a training period whose length varies from two to six months according to the colonies. Then, when they return to their village or urban area, they remain under the supervision of the midwife or visiting nurse who has trained them. A bonus system, depending on their activities and the results, is helpful in encouraging them to use the knowledge they have acquired. They may receive a midwife's instrument case (scissors, forceps, compresses, eye lotions...). Later, UNICEF participates in these emoluments. The matrons do their work in the home of the woman in labour or in an enclosure for childbearing, when the villagers have constructed it. In Indochina (Cochin China and Tonkin), rural midwives are called "Bâ-mû". They are very efficient, their average accomplishment in 1939 being 187 and 120 childbirths per year in Cochin China and Tonkin, respectively. Khmer "nursing midwives" of Cochinchine, recruited from among the minority Cambodians, are a local feature. They follow a six-month course and pass an examination, after which they practise in their ethnic group. It must be mentioned that these matrons are present in the towns and even in the big cities where there are public and private obstetrical clinics. Thus in densely-populated Dakar in 1960, one-third of childbirths take place at home with the assistance of a matron. It is true that the number of beds for expectant mothers in the hospitals is insufficient. - The Health Service sets up important units. Giordani* establishes a summary in 1939. - 433 maternity centres of which 364 are in hospitals and 69, mostly in Indochina, are independent establishments. - 158 paediatric nursing dispensaries of which 117 are in Tonkin. - 171 European midwives and 9 European visiting nurses. - 925 native midwives and 187 native visiting nurses. Many thousands of qualified matrons practise in rural areas and in the towns. - The percentage of premature babies is 8 times less when the pregnancy is supervised. - From 1936 to 1939, prenatal consultations increase by 22 %, assisted childbirths by 27 % and treatment of babies by 41 %. After the Second World War, the PMI is created in France by the edict of 2nd November 1945. It is established in the colonies on a new basis at the beginning of the 1950s. This is not an inferior version of the plan for Metropolitan France. On the contrary, a circular dated 1953 makes it clear that there are important differences, especially in what concerns children. In France, the PMI confines its activities to prevention and stop these activities at the age of six, the age of obligatory schooling. In the colonies, the PMI is responsible for the care of all children up to the age of six but also all those children between the ages of six and fourteen who don't go to school, that is to say, the majority of the children. The activities of the PMI must be, especially in tropical zones, an element of the public health service. Mothers and children are the most vulnerable members of the population. The staff in charge of these activities are physicians and social workers. 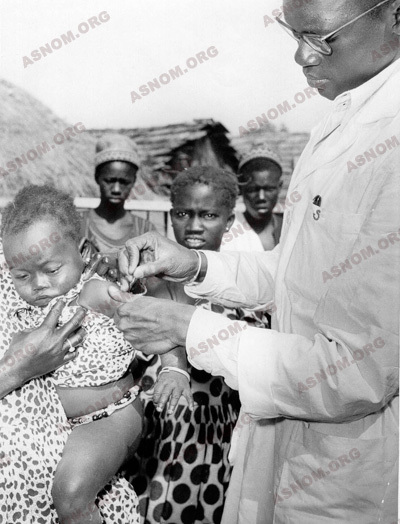 The most effective measures to be taken to protect the population are not the multiplication of PMI centres but, as Farinaud* proposes in 1943 in Dakar, the provision of drinking water, the evacuation of faecal matter and the fight against Malaria - three health projects whose results will be immediately evident. The Colonial Health Service creates in 1957 a special Paediatric Service. One of the first colonial paediatricians, Guignard*, after having served overseas and then directed the Rabat Paediatric service, will occupy the important post of Director of the International Child Centre in Paris. At the beginning, social workers are very few (one or two in a colony) assisted by native helpers. Their duties are not at all bureaucratic. On the contrary, they have a role to play in the countryside, by visiting dwelling places. They take over from the "visiting nurses" but with greater competency. The intended plan of action develops thanks to the financial support of national and, after the Second World War, international organizations, in particular the FIDES (Fonds d'investissement pour le développement économique et social). The schooling of girls and the alphabetization of women making progress, new maternity hospitals and PMI centres are built. The old ones are renovated. But there is a time-lag between developments in towns and the situation in the bush, and even between colonies. Madagascar with its very old School for Midwives is more advanced than Black Africa, especially the AEF. While continuing obstetrical treatment, maternity clinics also detect endemic diseases. Young mothers are particularly exposed to infectious complications among which puerperal infections are especially serious. Bad aseptic conditions contribute towards infection. Early detection and immediate hospitalization have a good chance of leading to healing without after-effects. An unexplained characteristic is revealed by the physicians : the rare occurrence in native women of phlebitis of the lower limbs, fairly common in Europe. On the other hand, they are more exposed to cerebral thrombophlebitis. In Pondichery, Guicheney* shows the Indian Union physicians the frequency of postpartum cerebral phlebitis in their country. He demonstrates the decisive role, much debated at the time, of heparin in the cure of serious cases of this disease. In rural areas, the matron remains the only possible source of aid. Knowing that the usual birth rate for natives is 50 for every 1 000 inhabitants, it appears that only a quarter of the pregnancies are controlled by the Colonial Health Service. At the beginning of the twenty-first century, international organizations esteem that this rate is 50 %. The development of the medical network cannot keep up with the demographical increase. The training and supervision of matrons becomes absolutely necessary. In Nairobi in 1984 the movement "Maternity without Risk" is launched. However, far from becoming lower, the rate of maternal mortality rose from 400 000 to 600 000 in the year 2000. The demographic growth can be given as one reason for this increase, all the more as more than 98 % of these deaths occur in tropical countries. These figures indicate that the suppression of all risks is still far in the future. The protection of children has two fields of combat : the nutritional dangers and the dangers of infection. all of which are available in the tropics. They are tested in hospitals and in the villages of the Dakar region used for experiments. These studies engender the programmes of nutritional supplements enriched with local foodstuffs; and baby food is produced industrially in many countries by United Nations agencies and, in particular, by the UNICEF. These products are distributed by the PMI centres to children in nurseries, kindergartens and schools. But they can also be consumed at home. The education of mothers in nutritional matters is a fight against interdictions and errors rather than food shortages. Private organizations participate in this campaign. Thus in 1953, the "Goutte de lait" (drop of milk) in Dakar provides the whole ration or complementary ration for 250 children every day. - The dangers of infection can be observed in the numerous digestive and respiratory infections that prevail. To these must be added the great tropical endemics, Treponemal diseases, measles and, above all, malaria. The advent of effective medicines and, principally, vaccinations render these illnesses controllable. - A new "PMI Centre" established in 1953. - A "Mobile PMI Service" that visits dispensaries. The team consists of a social worker who supervises the nurses and a midwife who takes over the prenatal consultations. - A hospital service, still lacking beds for all patients. After the establishment of the Dakar University, this plan of action becomes the responsibility of an academic, Professor Sénécal, who occupies the chair of Paediatrics which will eventually bring him international renown. The action in rural areas has three aims : nutrition with the ORANA, mass vaccinations, and the fight against the great endemics, especially Malaria. The total birth rate in French West Africa (AOF) increases in thirty years from 40-45 in 1930 to 50 (for 1 000 inhabitants) in 1960. The populations of tropical countries double every 30 or 35 years. As long as under-development persists, there will continue to be underprivileged rural areas where infantile death rates will be the double of those in the towns, which are better equipped against diseases. Finally, even in towns, we must bear in mind the deplorable situation in the slums and the emergent phenomenon of "street children".